1. THE PRETTY THINGS-"All Light Up"
Not since Jonesy banged out his psychedelic samba on a Mellotron on The Stones "We Love You" has there been such a magnificent use of that quirky little keyboard. 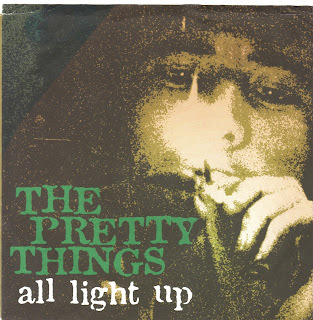 This Prettie's 1999 single, in my estimation, rates as the best thing they've done since "S.F. Sorrow" with great lyrics, ballsy delivery and of course some nifty Mellotron c/o keyboard player John Povey. 2. KENNY WELLS-"Isn't It Just A Shame"
Hidden away on the flip of 1966's "I Can't Stop" on Bob Crewe's New Voice label here's another classic mid tempo soul tune up the in the high $$$$ range. The harmonies and groove are timelessly infectious. Repeat as necessary. One of my fave Lee Morgan tunes has always been this somber reading of John Barry's film theme cut as a Blue Note 45 in 1969. It's bleak and melancholy delivery seems to evoke the gritty/sleazy yet interesting landscape of NYC in the late 60's and sounded even better when I wore a younger man's clothes at 4 AM when the clubs are all closed and the night was ending. On that note be sure to check out Netflix for the Lee Morgan documentary "I Called Him Morgan". 4. THE SCEPTRES-"Something's Coming Along"
Previously cut by The Swingin' Blue Jeans in 1967 this version was cut a year later by a Montreal, Canada group and issued at home on the Allied label and in the U.K. on Spark. The harmonies and musical backing is tighter than the Blue Jeans version and far punchier coming across like The Association and The Four Seasons (especially on the chorus!) meets The Episode Six: MAGIC! This monster rare soul civil rights anthem from '68 holds little of the funk you'd expect from that year and sounds like it was cut much earlier. Moved by strong horns and incredible lyrics it is of course a big "Northern soul" fave so good luck finding a copy. 6. 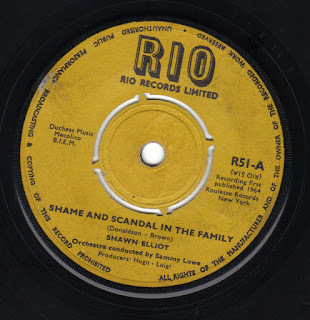 SHAWN ELLIOTT-"Shame And Scandal In The Family"
1,000 times better than the Peter Tosh and The Wailers version (credited to "Peter Touch") in my estimation, this 45 was cut in the US by one Shawn Elliott, a quiffed Puerto Rican Fabian/Frankie Avalon looking cat and issued in the U.K. on the ska label Rio. The musical backing is tighter and his vocals are far stronger than the "authentic" ska version mentioned earlier. Jon Hendricks departure from this mortal coil last week at the age of 96 came as quite a bit of bad news here at Anorak Thing. Jon had created a wealth of music, both as a member of Lambert, Hendricks and Ross and on his own. This rousing version of "Watermelon Man" comes from his 1963 single (he had previously recorded it with Lambert and Bavan). 9. RICK NELSON-"I Wonder If Louise Is Home"
From Rick's 1967 album "Another Side Of Rick" cut with the cream of the crop LA session players, this track is my fave on the LP. It's simplistic, orchestrated pop reminds me of Billy Nicholls or Del Shannon's UK recorded album "At Home And Away". 10. JACK HAMMER-"Down In The Subway"
Louisiana born soul/r&b belter Jack Hammer cut this track in 1965 with a gritty Hammond n' horns backing that leads me to believe it was recorded in the U.K. but it was only issued in Sweden the following year. Monster stuff!! Former Manfred Mann lead singer Paul Jones ditched jazzy r&b for M.O.R. pop and became somewhat of a crooner in the U.K. Most of his U.K. 45's were issued in the States on the Capitol label but for his 5th US 45 he switched to the Bell label. 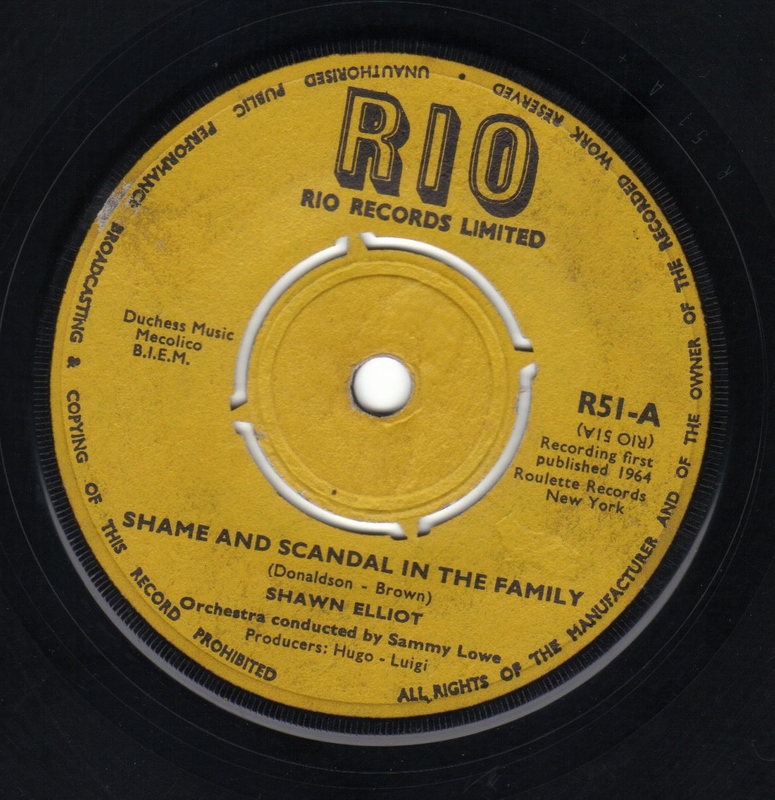 Issued in June 1969 (previously released in April in the UK as Columbia DB 8567) this Mann/Weil composition failed to chart (as did his previous US releases). 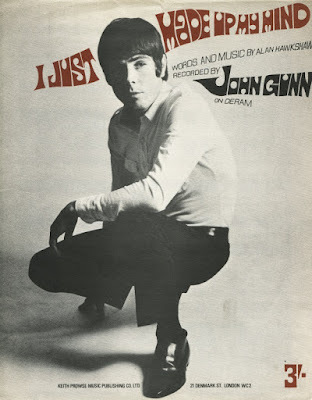 Interestingly it was produced by Paul Jones and arranged and conducted by Tony Visconti! 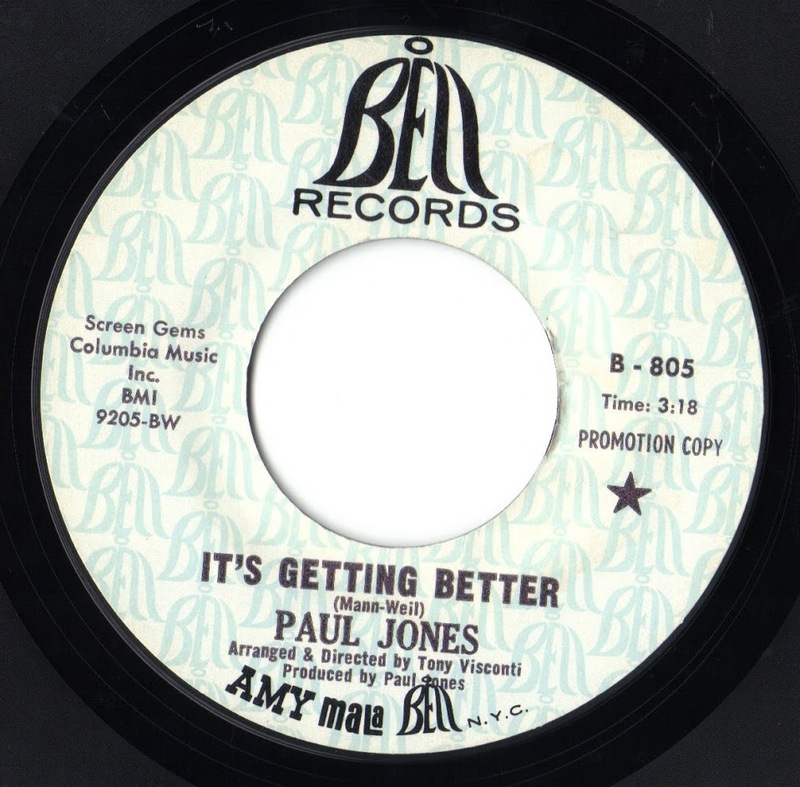 "It's Getting Better" is one of the biggest pieces of tripe I've heard despite it's dollybird backing vocals, regal harpsichord and flutes and strings. The flip side "Not Before Time" (written and produced by Jones) is 100 times better. It's a funky little instrumental led by his wailing harp and some wiggy Gregorian chant vocals on top of tribal sounding percussion. Think of it as an updated version of the old Manfred's instro "Why Should We Not" meets Syd Barrett's "Rhamadan". Both sides were collected on the RPM CD collection "Come Into My Music Box Vol 3". British vocalist Jon Gunn's brief career consisted of just two 45's on the Deram label. Both were issued in the United States as well as his home country. "I Just Made Up My Mind" was his debut. First issued in the UK as Deram DM 133 in June 1967, the track was composed by Alan Hawkshaw and had previously been issued in March 1967 by The Dodo's as "Made Up My Mind" (Polydor 56153). Today's U.S. subject was released in August 1967. 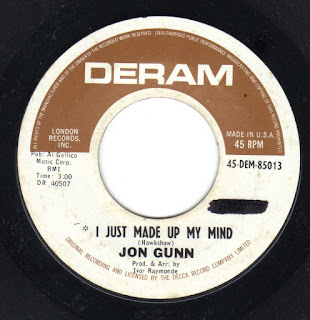 "I Just Made Up My Mind" is a perfect slice on archetype '67 Deram pop/soul from it's phlanged piano intro to sharp horns, sweeping soulful strings and it's uptempo danceability (all courtesy of Ivor Raymonde) and Jon Gunn's strong vocals that fall somewhere between Frankie Valli and Chris Farlowe. 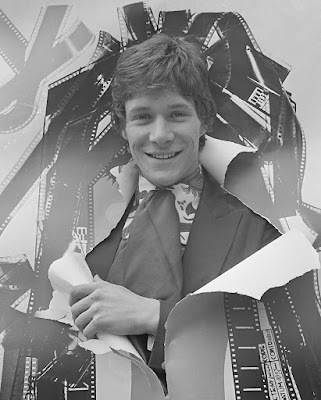 The number gained some brief popularity on the Northern soul scene no doubt thanks to it's uptempo beat and strings. The flip side "Now It's My Turn" is slightly less frantic. It's strings and brass and touches of vibraphone add a distinctly "Northern" feel to it but this is off set by some congas and a chorus that would not sound at all out of place on an Amen Corner Deram 45. 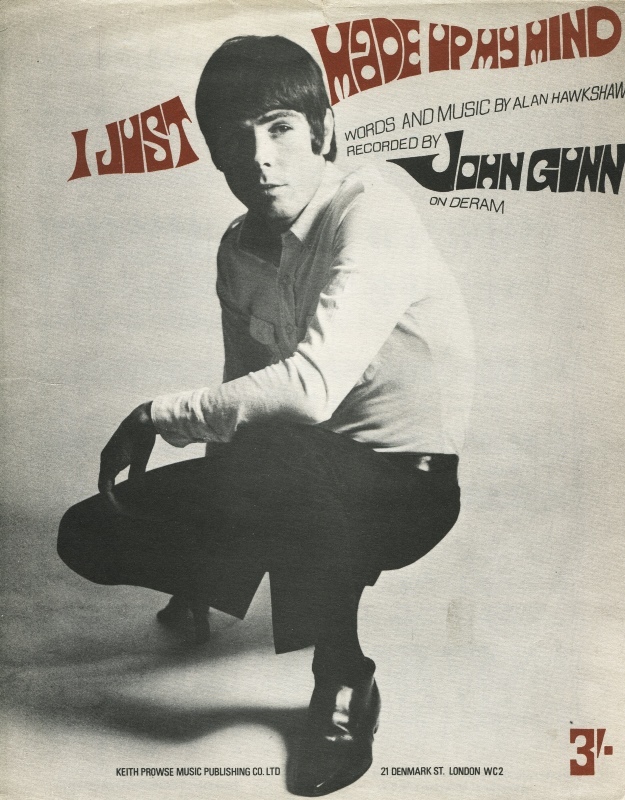 Gunn's follow up "If You Wish It/"I Don't Want To Get Hung Up On You Babe" was issued in Britain in December 1967 (DM 166). In the US an altered release was issued in January 1968 with a reading of the Macauly/Macleod ballad "Let The Heartaches Begin" gracing the A- side with "If You Wish It" bringing up the flip (45-85024). "I Just Made Up My Mind" was included on the highly recommended Deram/Decca collection CD compilation "The Northern Soul Scene", the flip side has sadly not seen a reissue anywhere as of yet.